Not much I love more than a good art wall- great inspiration shots- especially love the second one. I just found a good "art-wall-artist" yesterday, come check it out.... Also, the queen bee of Art walls is Anna Spiro, check out hers on her blog!! Oh.... and don't forget to show us! You can never go wrong with a great art wall! Don't you just LOVE ghost chairs? They've been on my must-buy list for the longest time now!! I love art walls! Your staircase would be perfect for an art wall. I love mixing and matching frames. Old frames, new frames, some canvas and in different finishes. I love the mix. 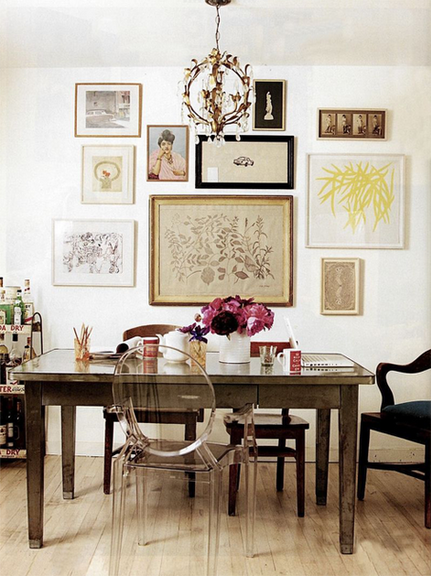 This is my goal too - I love the look of these art walls and am determined to have one too. We can push each other. Oh, by the way - can you and your family be any bloody cuter!!! I'm refering to the family photos at Crescent Beach. My goodness, how adorable you all are. Regarding your request about teaching photography - I wouldn't dare! I don't feel I know enough about it and still struggle to capture the image I want. I think it's hard for me as my friends are all professional photographers - I want to be able to snap out a perfect shot in seconds like they do. I'll see if I can talk one of them into a workshop here at the farm or something - in spring! That would be fun.